Often it is useful to be able to run a set of analysis / processing steps on a whole set of files, without needing to manually load and save the files separately within the GUI. Quantiphyse provides a simple batch processing system which gives access to most of the processing steps available from the GUI. Batch files are written in YAML syntax. Below is a simple example. The batch file is divided into three main sections. 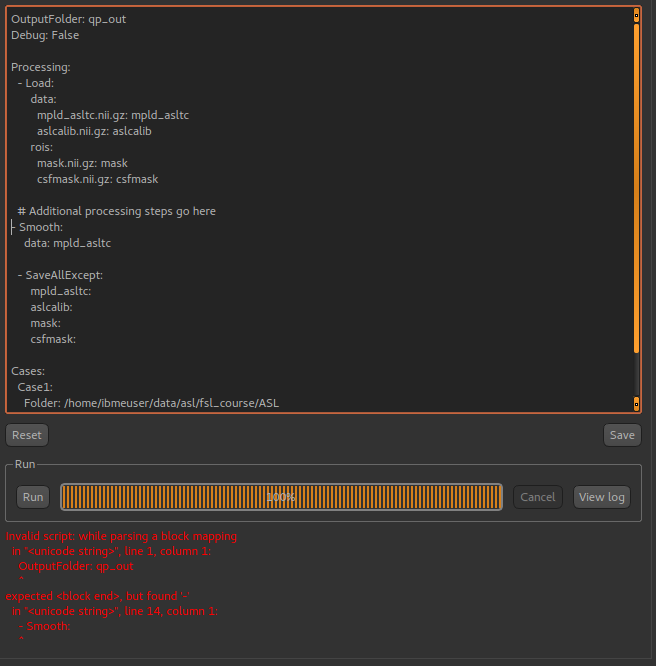 In this example we are putting all output data in the out folder and enabling Debug messages. Options defined in the defaults section can be overridden for a specific case. In this case we are loading a data file and an ROI which have the same filename for each of our cases, however this file name is interpreted relative to the individual case folder so different data is loaded each time. After loading the data we run the Fabber modelling tool. Options to provide to the tool are given here. Finally we save the three output data sets generated by the Fabber process, as well as the main data and ROI. These files will be saved in a subdirectory of the output folder specific to the case. Here we have three cases with input data stored in three separate folders. # What's going on here? In this case, the volume data will be saved in out/Subject1/roi_vols.txt. In this case the output is a tab-separated file which can be loaded into a spreadsheet. 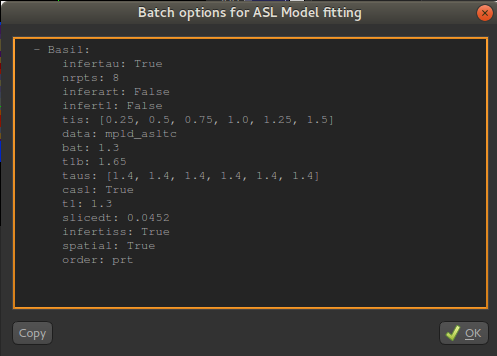 It can be convenient to build up a batch process during the course of an interactive session, for example to try out processing steps on a sample dataset and record the selected steps for later application to a group of cases. Quantiphyse provides some basic features to facilitate this. The Copy button copies this code to the clipboard where it can be pasted into a batch script that you are creating in a text editor, or using the Batch Builder widget (see below). 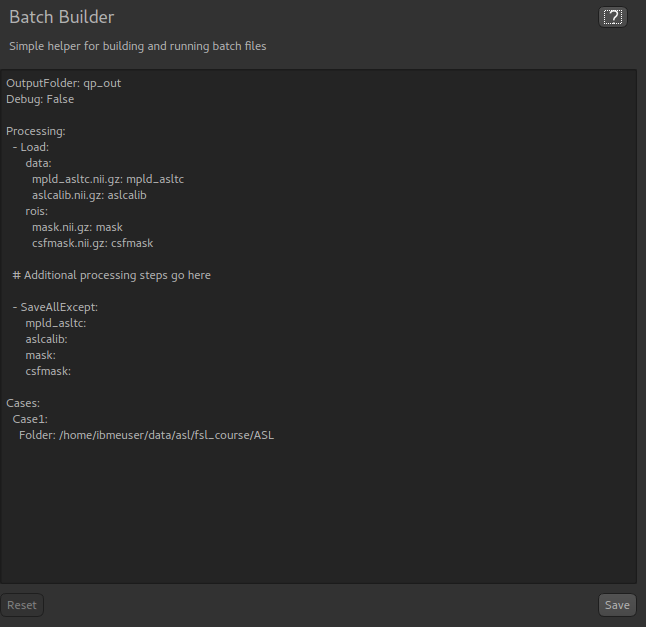 This widget is available from the ‘Utilities’ menu and gives a simple editor for batch scripts. This batch script can be Run to test it, and then we use Save to save it to a file when we’re happy. You can add cases and other processing as required. Reset will return to the ‘skeleton’ batch script with no custom processing. One common issue is the use of tabs in a batch file which is not allowed but can cause difficult to interpret errors. Therefore, if you use a tab character in the batch builder it will check and simply give a warning of Tabs detected. 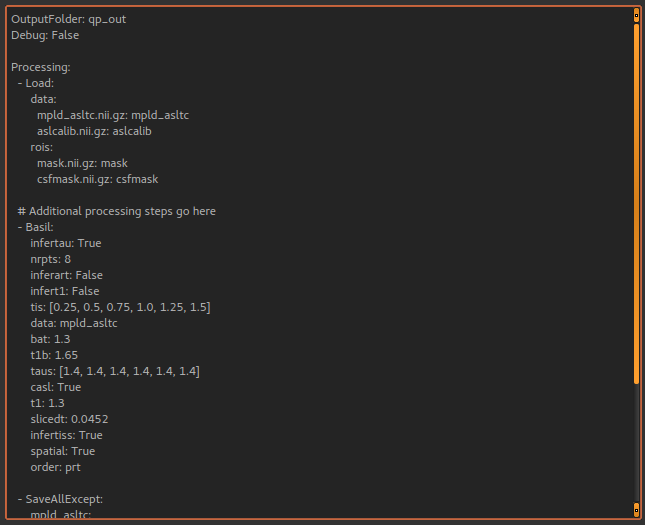 The processing modules available in the batch file are all included in the quantiphyse.analysis package. They all operate on data stored in the ImageVolumeManagement object. Data can be added to this object using the add_data and add_roi methods, which can take a Numpy array, provided it’s dimensions are consistent with the current main data. This means that you can load data independently or generate it programmatically if this is required. The volume management and analysis process APIs are not currently stable and you will need to read the code to see how to use them - a stable API may be defined in the future for this purpose.